K-TIG is an automated, full penetration process which pierces all the way through the joint, completing the weld without the need for a backing bar or filler materials. The K-TIG welding process involves a specially controlled high current arc which opens a full-penetration keyhole in the join between the two surfaces to be welded. The resulting weld is 100% parent material, eliminating the need for edge preparation or filler materials. The K-TIG controller monitors every aspect of the welding procedure to produce flawless welds at speeds up to 100x faster that traditional TIG without the need for experienced operators. 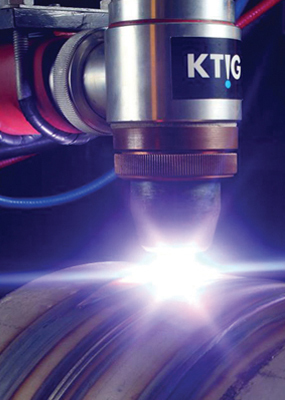 K-TIG provides enormous labour, material, gas and energy savings for a wide range of welding applications. Incredible results on more materials. In a single pass. K-TIG provides exceptional results across the widest range of exotic and conventional materials, and excels in medium to heavy gauge austenitic metals. 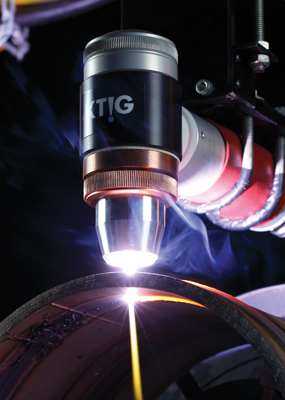 K-TIG welding is a low distortion process. Unlike plasma, laser and electron beam welding, K-TIG it is tolerant to imperfections and creates a highly stable, self-correcting full-penetration keyhole across a wide spectrum of specialist metals.